In the past few years, GTS has laid the foundations for future growth. 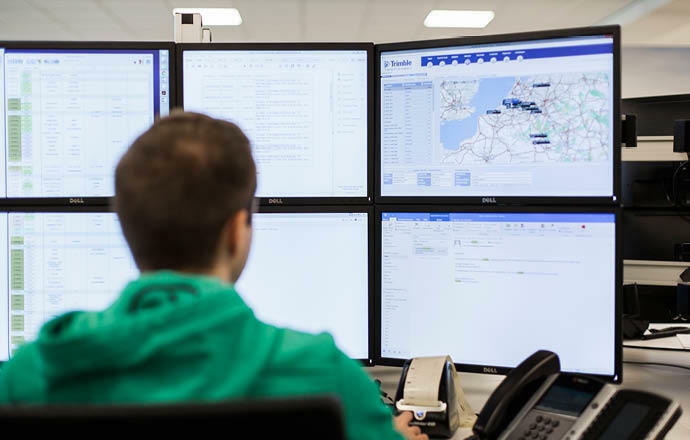 The transport company, whose main activity is container transport, has several offices at strategic locations and has invested heavily in IT tools. It is now using the third generation of Trimble CarCube on-board computers. “Checking and analysing the data from the on-board computers thoroughly enables us to differentiate ourselves from competitors,” says Ben Geybels, GTS’s Managing Director. We can only achieve competitive differentiation if we have all our costs under control. The CarCube gives us that opportunity. GTS is undeterred by difficult economic situations. It has a clear picture of where it needs to take its business. As a result of the investments, GTS now owns 105 trucks, another thirty were purchased recently. The company also has 160 trailers/container chassis. 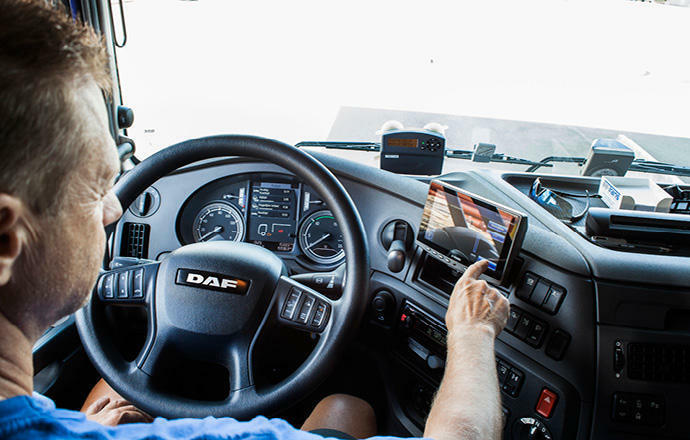 The thirty new trucks were equipped from the start with the CarCube on-board computer, and the others are being updated with the latest software. “We can only achieve differentiation if we have all our costs under control. We have the capabilities to do this with the latest version of the CarCube,” says Geybels. The company’s Managing Director took a very deliberate decision to use the new functionalities as soon the latest version of the on-board computer was available. He specifically mentions the capabilities offered by the FleetCockpit, the accompanying analysis tools and the driving style assistant. “It enables us to take the steps we need to give our customers better information on the one hand, and to improve our overview of our own work on the other”. The results turned out well, because GTS was able to reduce its fuel consumption on the basis of the CarCube data and supplementary tools. “By paying closer attention to our drivers’ driving behaviour, we have reduced fuel consumption by three percent.” Geybels emphasises that the comparisons that he can now make between one driver and another are carried out in the fairest way possible. “To do this, every group we created had a special feature. For example tours with a lot of stops, tours to the flat Ruhr area and tours to the Ardennes”. Using the CarCube’s data, the schedulers can also see the engine’s idle times. The number of repairs has also decreased as a consequence of better checks on the drivers’ driving behaviour. GTS limits wear and tear by analysing, for example, braking behaviour and the revolutions per minute produced. “We see immediately in the planning what the driving style is like, and can take pre-emptive action by sending messages to drivers. However, they themselves now know that we are trying to improve them in this area. This has resulted automatically in lower fuel consumption and fewer repairs”. Because of the real-time data and increased checking capabilities, accurate discussions take place between the schedulers and the drivers and between GTS and its customers. These are discussions about facts, not gut feel. Our analyses of waiting times at customers are becoming clearer because of them. We see where the cause of a problem lies and are therefore able to cut down waiting times. As a result, we save costs for both the customers and ourselves. Because data is gathered on every action, the status of goods and drivers is generated in every detail. Because document data are scanned and sent to the home base in Laakdal immediately on site, invoices are also sent sooner. “It is a nice example of a service you can use to keep your customers happy”, says Geybels. GTS now has several offices, in Laakdal, Antwerp and Tessenderlo, and makes tours to locations including Le Havre, Zeebrugge, Rotterdam and Bremen. “We actually visit all the European terminals very frequently.” The offices are mostly close to the railway or the water, creating opportunities for multi-modal transport. “Previously, rail and water were our major competitors, now we are making more and more use of their possibilities.” This increase in the options makes transport more efficient, but also more complex. IT helps to maintain an overview of operating activities and performance. For example, GTS has managed to obtain a better overview of wage costs and driving expenses despite these more complex chains. More than that, we have been able to reduce them by optimising our deployment of our fleet and drivers with the CarCube solution. We have also improved our tour allocation. As a result, the driver with the most hours in hand gets the longest tour. We can do that thanks to the knowledge that the time recording is correct and we prevent possible infringements of driving and resting times. Group-GTS’s main activity is container transport. With a vehicle fleet of 105 trucks Group-GTS provides tailor-made solutions for vehicle fleets, company sites, warehouses and automation. Group-GTS has several branches at strategic locations within Europe.